Scientifically referred to as Okapia johnstoni, the Okapi animal is a notable giraffid artiodactyls mammal known to thrive in Democratic Republic of Congo world over where it is explored on Congo Safaris and tours. It can be noted that despite the possession of stripped marking similar to those of Zebra, the Okapi is majorly related to Giraffe making them (Okapi and Giraffe) the only living members of Giraffiddae family. 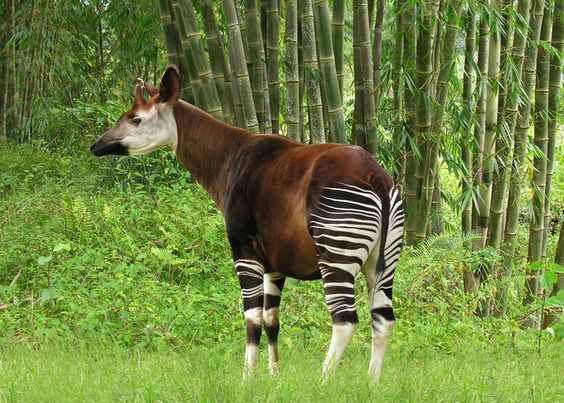 The Okapi rise to 1.5m in height and stretch to 2.5m in length while its weight ranges from 200kg to 350kg. It is marked by long neck, wide and flexible ears. The color ranges from chocolate to reddish brown with white horizontal stripes along with rings on the legs and white ankles. The Male Okapis posses horns called ossicones covered by hair stretching to 15cm in height while the females do not have horns as viewed on Wildlife Safaris in Congo. The Okapi Species are known to be diurnal thus graze during the day but can as well be active for a few hours in the dark. Apart from uniting to breed, the Okapi are majorly solitary and because of being herbivores, they spend time feeding tree buds, leaves, ferns, grasses, fungi and fruits. Following mating, the gestation period takes 440 – 450 days before producing a single calf which remains in hiding with infrequent nursing from the mother. The calf starts to feed at 3 months before weaning at 6 months. The calves are beautiful innocent creatures impressive to view and photograph on Adventure Vacation Safari in Congo Africa. The Okapi live in canopy forests rising to an altitude of 500 – 1,500m and are endemic to the dense tropical forests of Democratic Republic of Congo across the northern, eastern and central regions. The Okapi is listed as endangered on the International Union for Conservation of Nature red list and the main threats to their existence include increased habitat loss caused by human encroachment for settlement and logging. Illegal mining and hunting for bush meat have also contributed to the decline in their population. The exploration of this endemic species can be combined in a Congo gorilla safari to Virunga National Park or with adventure hike to Nyiragongo Volcano with the world’s largest and most violent lava lake.